I don't know about you dear readers, but at the end of July/beginning of August I love to be surrounded by luscious, rich colors and lush flowers! Plenty of those, please! You will find all kinds of roses in full bloom where I live and it is just wonderful to stroll along the flowering gardens and through the local market to check them out. 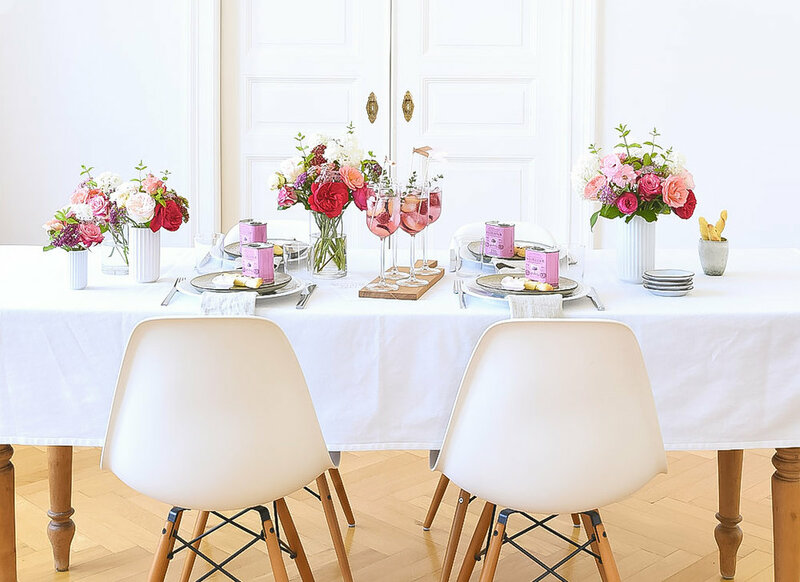 For this month, let's lay a summer table in shades of pink, red and apricot, sip on a berry-infused drink, munch on some bread sticks before lunch is served and enjoy a relaxing gathering with friends, what do you think? You might have noticed my preference for small bouquets on the dining table in columns past as they allow guests to see each other, which makes conversation much easier. This time I combined various types of roses with Milfoil, Hydrangea Annabelle and some sprigs of Mint. When the weather is beautiful I do not want to spend a lot of time in the kitchen and so I prefer quick and easy recipes such as a Raspberry & Plum Secco! 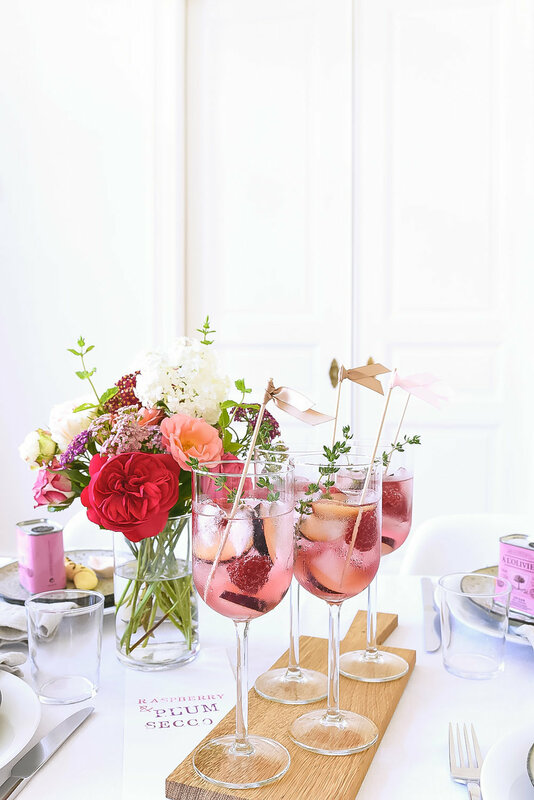 All you need is Prosecco, berries or suitable fruits of your choice, a little bit of syrup like raspberry, elderflower or blackcurrant and ice cubes. I also added some thyme and wooden sticks adorned with ribbon flags that I simply tied on. Below I've included an easy recipe for homemade bread sticks that I found on ein fach malein fach Blog, and they are delicious and perfect for a starter to munch on right before you serve your salad and pasta dish. The crispy sticks taste particularly good when dipped into flavored olive oil. I brought the small pink tins of marjoram olive oil that you see here back home from Cote d'Azur last week and they worked perfectly as small gifts for my guests. As I am a big fan of paper I often use beautiful wrapping paper as a wall hanging to decorate for a special occasion. 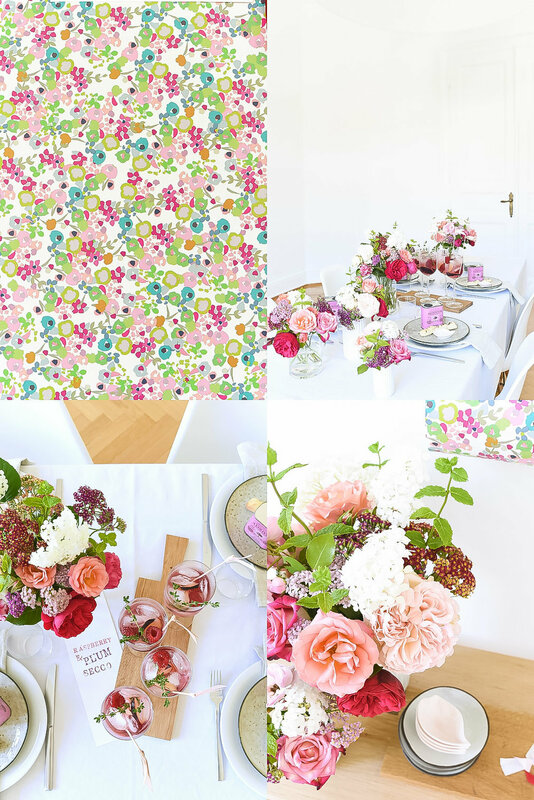 My flowery gift paper teamed up with a matching magazine tear showing roses, a welcome message I made using rubber stamps and a simple tassel made of tissue paper and ribbon - my DIY decor idea was ready for the wall. Easy and with little effort!